Win $2,000 with Kate, Tim and Marty! Spotlight are gearing up for Halloween, and so are Kate, Tim and Marty! They’re giving you a chance to score $2,000 to spend at Spotlight this Halloween. Guess the trick to win the treat! 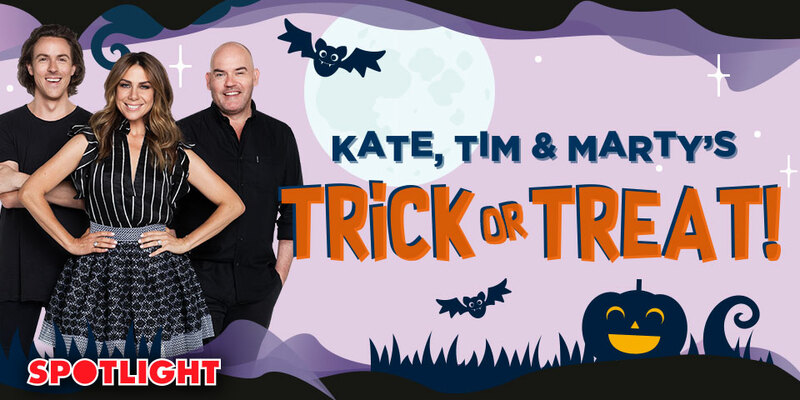 Each day Kate, Tim and Marty will share some ‘Ghoulish’ stories from around the world … you need to pick the trick headline to win! For your chance to play, register below and you could get a call from Kate, Tim and Marty. Tell us in 25 words or less why you want to win $2,000 with Kate, Tim and Marty? (b) answering the following question in 25 words or less: “Why do you want to win $2,000 with Kate, Tim and Marty?” (Answer). (c) invite up to ten (10) of the “best” Selected Entrants from that weekday (based on the Judging Criteria, in the Promoter’s sole and absolute discretion) to participate in the On Air Challenge between 4.00pm (AEDT) and 6.00pm (AEDT) that day during the Promotion Period (On Air Challenge) (each, a Challenger). (a) Three (3) headlines will be selected by the Promoter in its sole and absolute discretion (each, a Headline). Representatives of the Promoter will read the Headlines on air (as determined by the Promoter in its sole and absolute discretion). (b) A Challenger will be selected to appear on air and will be asked to name the false Headline (as opposed to the true/real Headlines) (as determined by the Promoter in its sole and absolute discretion) within a nominated time frame. (c) Should the Challenger successfully identify the false Headline within the specified time period (as determined by the Promoter in its sole and absolute discretion) the Challenger will be awarded a prize. (d) Should the Challenger fail to, or incorrectly, identify the false Headline within the specified time period (as determined by the Promoter in its sole and absolute discretion) then the Challenger will not be awarded a prize and the Promoter will (in its sole and absolute discretion) invite another Selected Entrant to appear on air as a Challenger to identify the false Headline. (e) The Promoter may (in its sole and absolute discretion) provide clues and hints to Challengers during a contesting spot however the Promoter is under no obligation to do so. 12pm and 6pm AEDT weekdays during the Promotion Period. If the entrant does not answer their phone by the time that phone goes to a message bank, the entrant consents to the Promoter broadcasting that entrant's voicemail message including their full name and/or business name live on air. Each entrant warrants that it has obtained all consents from third parties to broadcast live-air any information or names (including business names) in the entrant’s voicemail message. Each entrant warrants that they have received all consents from third parties that may ordinarily answer their Personal Contact Number in the entrant's absence to be broadcast live on-air if that third party answers the relevant phone live on-air. If a third party answers an entrant's Personal Contact Number, that entrant will not be eligible for a prize as determined by the Promoter in its absolute and sole discretion. If for any reason a Selected Entrant is unable to be contacted, the phone goes to voice message, their phone line drops out, or they are inaudible, or the Selected Entrant declines, or is otherwise unable to participate on air, the Promoter may, in its sole and absolute discretion, contact the Selected Entrant who submitted the next “best” entry based on the Judging Criteria and invite them to appear on air during the promotion period, and participate in the On Air Challenge. The Promoter will continue this process until an entrant has been successfully contacted and the entrant has confirmed their eligibility and ability to appear on air and participate on air as a Selected Entrant/Challenger (as applicable). All valid entries will be individually judged by representatives of the Promoter (in the Promoter’s sole and absolute discretion) by 6pm AEDT Friday 26 October 2018 at the Promoter’s premises. All valid entries will be judged based on the Judging Criteria. Where entrants are required to participate in a challenge or on air game, the Promoter may specify the relevant judging criteria prior to or at the time of the challenge or on air game. The cash prize will be transferred to the winner’s nominated bank account.